St. Andrew’s Episcopal School cherishes the Decade of Childhood by educating children in Pre-Kindergarten through the 8th Grade. Small classes and caring teachers provide a challenging learning environment where children grow intellectually, socially, and spiritually. 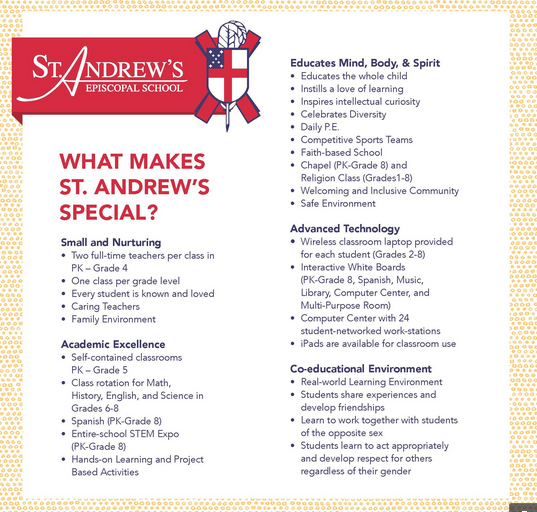 St. Andrew’s encourages faith formation and moral development by providing worship services, classroom instruction and opportunities for reflection and inquiry. Our students are excited about learning and about giving to others through community service. We have an intimate, attractive campus featuring six classroom buildings and two playgrounds located on South Carrollton Avenue in Uptown New Orleans. Poised for growth, we plan on adding an additional classroom building in the near future to accommodate enrollment demand.